If you just bought the newly released Scrivener 3, or if you’ve had the older version(s) for a while and haven’t used it yet, there is one constant: the intimidation factor of the Scrivener interface. I consider myself pretty tech-savvy, and I’m a bit of a Word expert (buffs nails, pats back), but Scrivener was pretty terrifying to me at first glance. When I first bought Scrivener, all I could do was stare at it wide-eyed as my brain screamed, WHAT IS ALL OF THIS? I was, to say the least, daunted by the interface and the myriad of options and settings. At the beginning of this year I’d had Scrivener for years and never really used it, so I put it on my 2017 New Year’s Resolutions to learn the thing. I looked up all kinds of ways to learn the software. After doing some digging, and finding lots of pricey classes and expensive pay walls, I decided that there was no way I was going to pay anyone to teach me. I don’t begrudge anyone trying to make a living from teaching others how to use Scrivener, but I personally don’t find it a necessary expense. Being stubborn and cheap paid off: with a few simple Google searches, I found quite a few resources online and learned Scrivener for free! The following is a list of all of my favorite FREE Scrivener resources. With Scrivener 3’s recent release on November 20, as of this writing there’s not a whole lot out there yet specific to Scrivener 3. But, the interface is almost exactly the same, so besides an updated appearance, I think you’ll find the following resources just as helpful and relevant as ever. I was trying to change my name as it appeared when I compiled my manuscript for submission. I tried editing the meta data, which was an acceptable one-time fix, but it kept showing my maiden name by default. For the life of me I could not figure out why, since Scrivener is registered under my married name. 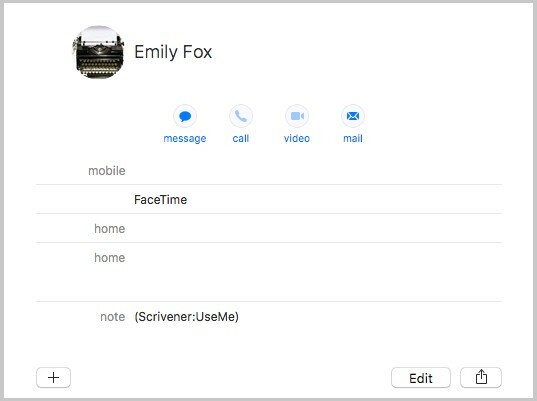 I discovered that to change this on a Mac, you simply go into your contacts (⌘+space and search for Contacts), then create or edit your own contact name and address as you would like it to appear and add the following in the note section: (Scrivener:UseMe) Ta-da! This YouTube video by Author Strong Writing & Publishing Tutorials is only about a minute long, but if you’re as intimidated by Scrivener’s complexity as I was at first glance, then you’ll likely appreciate this brief tutorial that walks you through how to create a new file in Scrivener and use it like you would with any word processor: no bells, no whistles, just writing. Although he uses a previous version of Scrivener, Scrivener 3 is exactly the same except for a slight difference in appearance. Quick, easy and to the point, this will help you dive right in. All Things From My Brain is a blog by author Patrick Hester. One of the first things I needed to know was how to format a finished manuscript for submission, and I found out how to do that here. Click on the Scrivener Quick Tips tab at the top of his blog for more help. Writers In The Grove is a blog by/for a creative writing group in Forest Grove, Oregon. Click on the Scrivener Tips in the Tags column and you’ll find lots of free help for using Scrivener. The posts tend to be extremely detailed so get started first thing in the morning after a good night’s sleep with your cup of coffee, and get ready to learn! Simply Scrivener is a site that offers pay classes, but there are many useful articles here under The Table of Contents tab that are available for free. One of my favorites is how to organize the Scrivener Binder. The Scrivener binder is so detailed you can tell its extraordinarily useful, if only you could figure out what the heck is going on in there. This tutorial helped me figure that out so I was able to fine tune the binder for my projects. Gwen Hernandez is an author and Scrivener expert who wrote Scrivener for Dummies and also offers Scrivener classes and workshops as well as private training. She also has a nice little treasure trove of free help under her Scrivener Articles tab. There’s so much specific help available there, that it’s worth bookmarking so you can return when you need a definitive answer on something. Scrivener Bootcamp is a video tutorial by author Jason Hough. The video is an hour and a half long, and was focused on helping users get started using Scrivener for the first time for NaNoWriMo. It’s very detailed and he walks you through how to use the software, explaining everything along the way. The Scrivener for Dummies Cheat Sheet is a cheat sheet that briefly explains the user interface and has a list of keyboard shortcuts to help you quickly access some of Scrivener’s many functions. I would be remiss if I didn’t include the makers of Scrivener, Literature & Latte, in my list. Their website’s Learn & Support tab also shows their video tutorials, user manuals and user forums, where people share their tips and ask for advice. Their video tutorials are great because they address very specific issues on common topics, so you don’t have to sift through two hours of video to learn how to do one thing. They also have a Youtube Channel with several instructional videos that can help you learn their software. If you run into a major stumbling block (as I did with my name issue) you can also contact Literature & Latte directly using the contact form on their website. After I emailed them, it took literally one business day for them to contact me with the solution. Amazing! Those are my favorite free Scrivener resources! I hope they help you get the most out of this incredible writing tool.